Eventing Nation had a post about the new SmartBlanket app yesterday, and being that I am in the midst of fussing about Tristan’s blanketing options, I downloaded it instantly and spent some time playing with it. 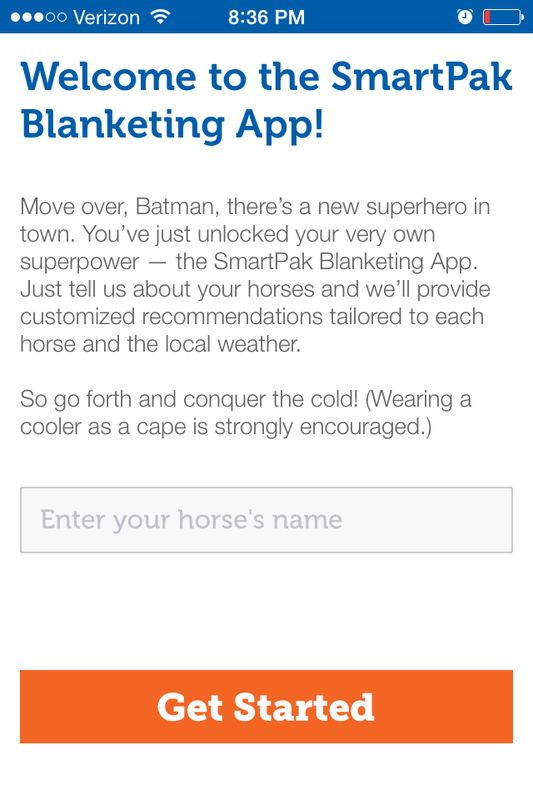 The app purports to offer tips about blanketing, based on a series of customizable questions about your horse and your location. You can add multiple horses later on. 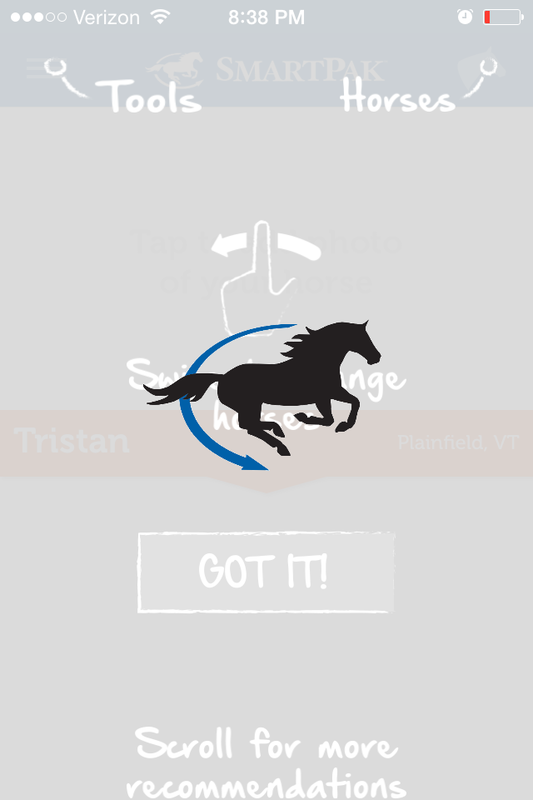 So here’s Tristan’s information in the add-a-horse phase. I liked the questions they asked, actually, and there were lots of options in each section. One option under clipping style was “show coat,” which took me a while to figure out – they mean clipped short but not all the way down to the skin. I’ve never seen a horse clipped like that, but I guess anything is possible! Here’s the thinking screen. That little blue arrow circles the horse. Kind of fun. It made this thinking screen anytime I changed a setting for Tristan. It didn’t last terribly long – a second, two or three at the most. I’ve waited much longer for apps to load! Ta-da! 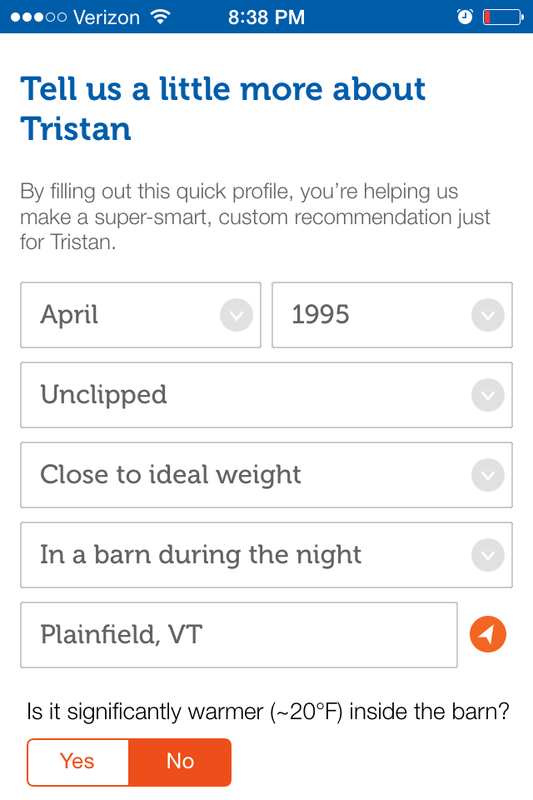 Here’s Tristan’s recommendations. I really like that they gave separate recommendations for night versus day, keeping in mind that it would be colder overnight. They also took into account the rain – if you scroll down to days when there’s no rain predicted, it suggested I leave him with no blanket. I monkeyed back and forth with the settings quite a bit – pretending he was all the way clipped, partially clipped, overweight, underweight, etc. I got it to tell me he should go totally naked all the way up to a medium weight turnout overnight, depending on the settings. The little “i” next to each blanket type will lead you to more information, telling you what exactly they mean by each blanket. It’s easy to adjust the settings: see the horse head in the upper right-hand corner? Tap on that and it gives you a list of horses you have saved. 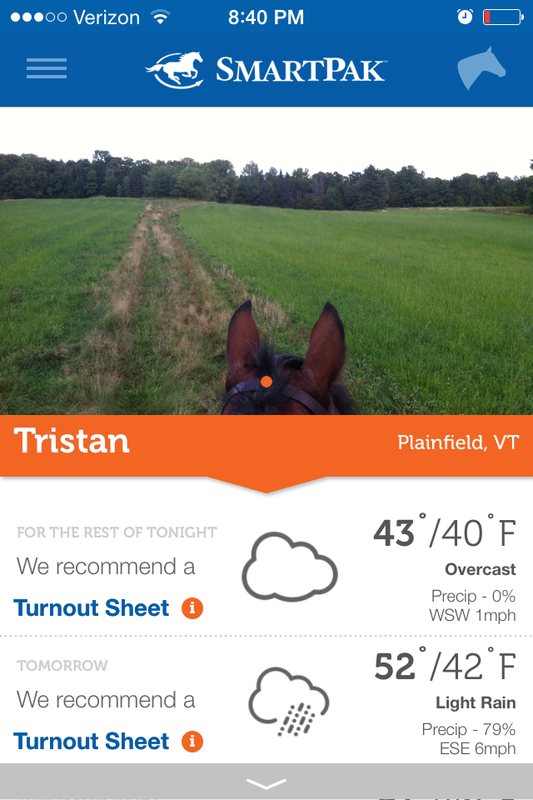 Then you tap on the horse’s name and it brings you back to the information screen that I showed above. You can just adjust things from there, save them, and then it will recalculate everything. In general, I was pleasantly surprised to see this app erred on the conservative side for blanketing. I admit, I was expecting it to recommend all the blankets! all the time! and it definitely didn’t. For example, on the night when it recommended just a turnout sheet for Tristan, he would probably wear a stable sheet + turnout sheet, or a cooler + turnout sheet. Yesterday during the day, he was actually wearing a stable blanket + turnout sheet. This year is the first year he’s being blanketed that aggressively, though – remember, he colicked from the cold just a few short weeks ago. Any other year these recommendations actually would’ve been spot on, or perhaps a titch more than he needed. Moral of the story? If you are really new to blanketing, or new to your horse, and need some rough guidance, this actually works really well! I love the updated weather information, I love the customizable features, I love that it saves multiple horses. If you need some more information to take in while considering your decision (if you’re like me and can’t get enough data points for neurotic things like this) it’s a great thing to have around. I think its recommendations are a lot like what an old trainer of mine used to say about Pony Club stuff: you will always be okay following their rules, but sometimes there’s a better way to do things. It’s a good baseline. Another thing about which I was pleasantly surprised: it didn’t push the Smartpak brand sheets too much at all. I didn’t really even notice too much brand creep. Just the facts, ma’am. The last pieces of the app were interesting, but not terribly useful for me, honestly. Again: if you’re new to blanketing, or new to blanketing a particular horse, I think some of the fit tips, how to measure, and blanket type glossary information would be really useful. I read through a lot of it and it’s good, solid information. I even learned some things I’d never heard of before: apparently a rain sheet is something even more specialized than just a waterproof turnout. HUH! 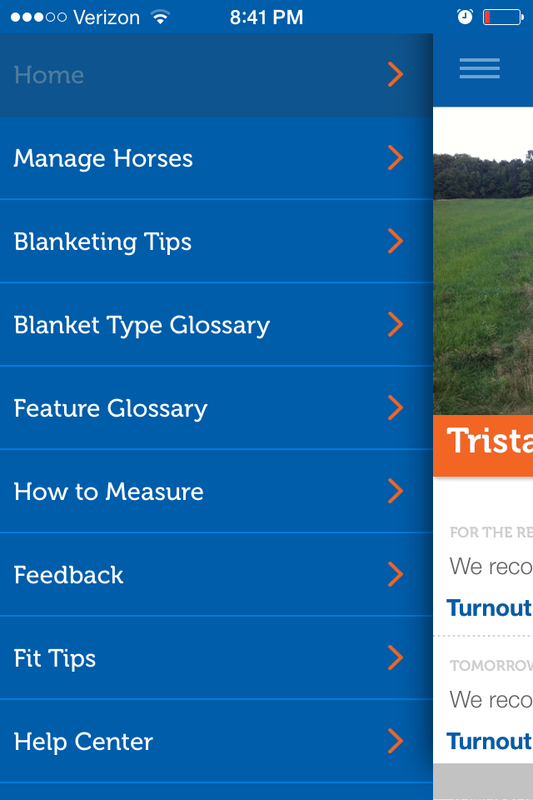 If you find yourself in any of the situations I listed above – new to blanketing, new to blanketing a particular horse, or in need of/curious about extra data points for your own blanketing – I’d recommend this app. If you’re a longtime, confident blanketer with a horse you know well, I’d probably skip it. Anyone else download it and play with it? What do you think? Next Post Wordless Wednesday: Happy Birthday, Puppy! I haven't yet, but think it's cool. My barn owner pretty much handles what the horses wear, but this is a great tool for lots of different people. Great review! I saw this app advertised yesterday and was curious about it. Sounds like a good idea for sure. I wouldn't have known but I saw it on EN. Our barn manager is a pro at sorting out blanket changes too, but it was neat to have this as backup. I loved the idea! I think maybe as with most things with horses, you can't get the degree of finicky specialization you might want.